Nam Sang Mi will costar with Kim Rae Won in the drama “The Trencherman"
Actress Nam Sang Mi will costar with Kim Rae Won in the 24-episode drama "Gourmet" scheduled to be aired in the first half of 2008. On 9/13, the production company "JS Pictures " announces that it finally selects Nam Sang Mi (23), who just completed the drama "Time between Dog and Wolf", to lead this drama. NSM will play the role Jin Soo who is a contracted journalist in a news agency and dreams to become the best columnist on food and nutrition. Jin Soo has bright and vivid personality. She came across the main male character Sung Chan , played by Kim Rae Won in various occasions and then falls in love with him. In the meantime, actor Choi Bool Ahm will play the chief chef in this drama. The production cost of this drama is around 12 billion Won. The filming is scheduled to start on 9/17. The main filming site at Yoon Ahm Jung is under construction and will be completed early next year. MBC TV drama series 'The Legend' will be created into a Japanese manga (graphic novel). At a press conference held on the 14th, manga artist Ikeda Riyoko, also famous for 'Rose of Versailles,' announced she will be creating a manga version of 'The Legend' starring Hallyu star Bae Yong Joon. The manga version of 'The Legend' will be featured in 'Tokyo Isshukan' and 'Kansai Isshukan' starting on the 25th. Ikeda Riyoko comments, "There have been reviews saying the nose and chin lines I draw is similar to Bae Yong Joon. My friends that are fans of Bae Yong Joon told me that if I reject the offer, someone else is going to draw him anyways so to accept the offer." 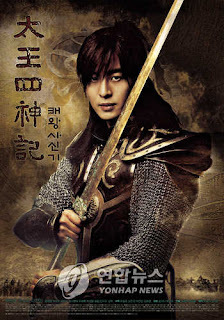 Bae Yong Joon delivered a message regarding the news, "It is an honor that Ms. Ikeda is going to draw the manga version. I am looking forward to it," expressing his gratitude. Actress Lee Ae-jeong (20) was belatedly reported to have died of a brain tumor. The news first broke on the Internet Thursday. Diagnosed with the disease in July last year, Lee underwent two surgeries and was relocated to the provinces, where she passed away on Sept. 6. Since playing the child role played by Han Chae-young in the famed drama series 'Autumn Tale,' Lee had been regarded as a promising young talent. She reportedly did not want news of her ailment to be released to the public. Since her death, a growing number of netizens have visited her Cyworld homepage to pay condolences. Greetings that Lee wrote on the site before she died include the message, "Thank you everyone. I'll heal quickly to repay your gratitude. Thank you. I love you." Gong Yoo, star of the MBC Monday-Tuesday drama 'Coffee Prince', was caught on camera trying to avoid the hot weather. The pictures from the drama’s filming location of Gong Yoo trying to avoid the heat is displayed on his fanclub site, ‘YOO & I’ (http://cafe.daum.net/gongyoo). In order to avoid the hot summer, Gong Yoo was seen blocking the sun with a large umbrella and using a fan while reading lines. He was also seen using a mini electric fan during breaks and having a cold glass of ice coffee, worthy of being named ‘Coffee Prince’. During the last filming of ‘Coffee Prince', the drama’s actors and crew were seen full of laughter, working in harmony and showing great teamwork even in the hot summer weather. Gong Yoo is being named as Korea’s most complete and well-rounded man (Wansonam) after filming the drama ‘Coffee Prince’. The clothes and accessories he wore in the drama is also receiving much attention and growing in popularity.